A prominent member of the London aristocracy, Constance Gwladys Robinson (1859-1917) – Lady de Grey, later Marchioness of Ripon – was a key patron of the Royal Opera House from the 1880s to 1914. Her collection consists of two large photograph albums containing 180 portraits of singers, composers and others in the arts, many of which are signed and dedicated to her. These personal tributes show that Lady de Grey was highly regarded by significant figures in the arts world, and her captions to the photographs in turn show her appreciation of their art. Born the Honorable Constance Gwladys Herbert on 24 April 1859, Lady de Grey was the youngest daughter of Sidney Herbert, 1st Baron Herbert of Lea, and Mary Elizabeth A'Court-Repington. In 1878, she married St George Henry Lowther, 4th Earl of Lonsdale (1855-1882) and became Lady Lonsdale. The couple had a daughter, Lady Gladys Mary Juliet Lowther (1881-1965), known as Juliet. In 1885, Lady Lonsdale married Frederick Oliver Robinson, 4th Earl de Grey (1852-1923) to become Lady de Grey. When her husband became the 2nd Marquis of Ripon in 1909, she assumed the title Marchioness of Ripon (also known as Lady Ripon). Through her influence, Augustus Harris was made manager of the Royal Italian Opera, Covent Garden, in 1888, and the theatre’s fortunes began to improve after a period of decline. Lady de Grey’s patronage gave her influence over all major decisions, including the commissioning of new operas, the engagement of singers, and the granting of box subscriptions. She supported Harris in his decision to introduce performances of operas in their native tongues (previously all operas were performed in Italian translation). 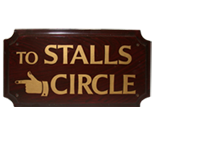 This led to the renaming of the building from the Royal Italian Opera to the Royal Opera House in 1892. Lady de Grey was friendly with many of the famous singers of the day. She was particularly close friends with Nellie Melba, whom she introduced to Covent Garden after seeing her perform at the Théâtre de la Monnaie, Brussels. 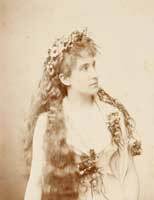 Following an unsuccessful début performance in 1888, Melba was initially reluctant to return, but with Lady de Grey’s persuasion she was encouraged to sing again a year later to great acclaim. In 1901 Lord de Grey acquired Coombe Court at Kingston, Surrey, one of his many residences. It became well known for dinner parties hosted by Lady de Grey, to which opera singers, artists and literati were invited. In her autobiography, Melba describes a memorable party at which Oscar Wilde entertained the guests. After seeing the debut of Serge Diaghilev’s Ballets Russes in Paris in 1907, Lady de Grey was determined to bring the company to London, resulting in the historic season of Russian ballet at Covent Garden in 1911. It is said that Lady de Grey was present every time Vaslav Nijinsky danced. When the activities of the Royal Opera House were halted during World War I, Lady de Grey devoted her time instead to the King George Hospital, where she went daily to care for injured servicemen. Shortly before her death on 27 October 1917, she was working to establish a scheme for the care of paralysed and disabled soldiers near their own homes. Acknowledgements: Desmond Shawe Taylor for his bequest of Lady de Grey's albums, which were conserved through the generosity of the Wolfson Foundation and The Friends of Covent Garden.